Availability UK purchasers may send a cheque for £10.85 payable to EBUA to the address shown on the EBUA Website. Alternatively, payment may be made using a debit or credit card via PayPal from the same page. Non-UK purchasers are kindly requested to the EBUA to confirm cost. Synopsis Natalie Melmore's assured presence as presenter and narrator sets the scene for a highly commendable and watchable DVD that complements the EBUA's excellent Home Study Manual. 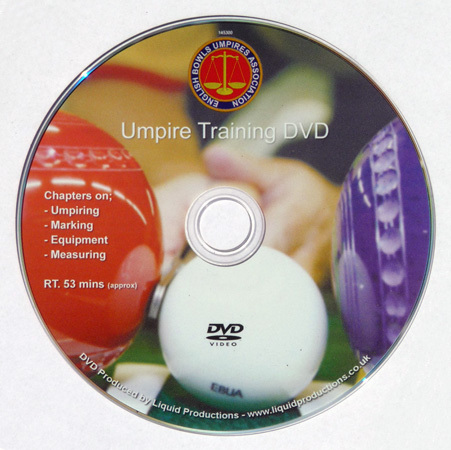 All aspects of umpiring (to first grade level) and marking are demonstrated and explained very professionally by Allan Thornhill and his colleagues to provide a first-rate, practical DVD. In addition to complementing the manual the DVD provides a valuable resource for umpires of all grades as well as those bowlers involved or interested in umpiring, marking and measuring. Clubs too should seriously consider purchasing a copy on behalf of their members to allow them to borrow and enjoy watching it at their leisure. *Click here for a guide to the list of countries covered by this coding.